As the United States entered the 20th century, increasing population and industrialization led to a nationwide meat shortage. Moving west to acquire more land for grazing or hunting became a limited option as the frontier closed and buffalos were hunted into near extinction. In southern Louisiana, newly invasive water hyacinths, similar to water lilies, transported to New Orleans by Japanese tourists during the 1884 World’s Fair were creating massive ecological dilemmas. In 1910, an audacious plan was put forth to address both concerns: import hippopotamuses from Africa to the bayous of Louisiana to consume the water hyacinths and provide a tasty source of meat for a hungry nation. The main proponent of this imaginative plot was Louisiana Congressmen Robert F. Broussard. In order to get Congress to approve and fund his $250,000 (ca. $6 million adjusted for inflation) proposal, Broussard needed renowned and popular “experts” to testify in Congress. He sought an unexpected duo, Frederick Russell Burnham and Fritz Duquesne, aka the Black Panther, for assistance. Burnham was the epitome of an American adventurer and Duquesne was a Boer, an African of Dutch dissent, and a notable conman. Fritz Duquesne in the Boer Army. ca 1900. Wikipedia Commons. 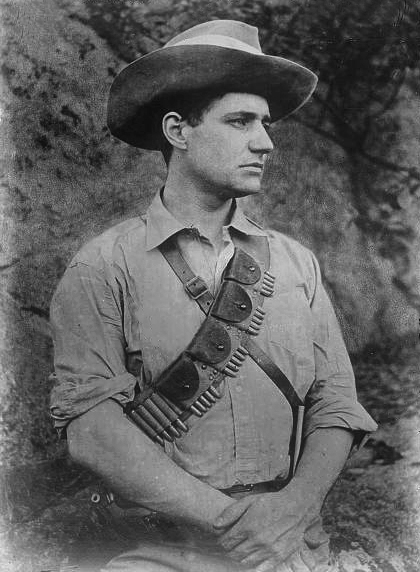 Burnham and other Americans to Africa to fight for the British Empire against Boer and African resistance to British colonization. On the contrary, Duquesne fought against the British. Both men were well revered and became old-fashioned rivals with direct orders to assassinate the other, yet they never met in any of the bloody battles during the Second Boer War. The war ended in favor of the British, but the respected rivalry lingered on. To the surprise of many, Broussard managed to get the archenemies to cooperate and testify for H.R. 23621, dubbed the “American Hippo Bill”. Not even a decade before advocating together for hippo migrations, they were hunting one another in the vast stretches of Africa. The three men worked in tandem to sell the idea. Burnham continually noted that the majority of animals Americans eat, e.g., pigs, chickens, cows, sheep, etc., are not native animals. Why not bring the hippo here, just as those animals were brought centuries earlier, to regions unsuitable for most American grazing animals? Former president Theodore Roosevelt publicly supported the idea. The New York Times, The Washington Post, The Chicago Tribune, and other major newspapers also voiced their approval. The New York Times was exclaimed excitement for “lake cow bacon”. The U.S. Department of Agriculture also advocated on Broussard’s behalf. To the dismay of many, the bill failed by one vote. The dream of hippo ranches in the Louisiana bayous was crushed. The future of agriculture would continue to be one of mass industrialization and factory farms. After this failed attempt, Duquesne moved on to become a spy for Germany in New York City during WWI through a plethora of aliases. In the 1930s, he joined an American pro-Nazi party and led a massive espionage network for the Third Reich. The Duquesne Spy Ring was eventually busted by former FBI director J. Edgar Hoover. It remains the largest and most intricate espionage case in U.S. history. It seemed the Black Panther always picked the losing side of whatever conflict in which he engaged. 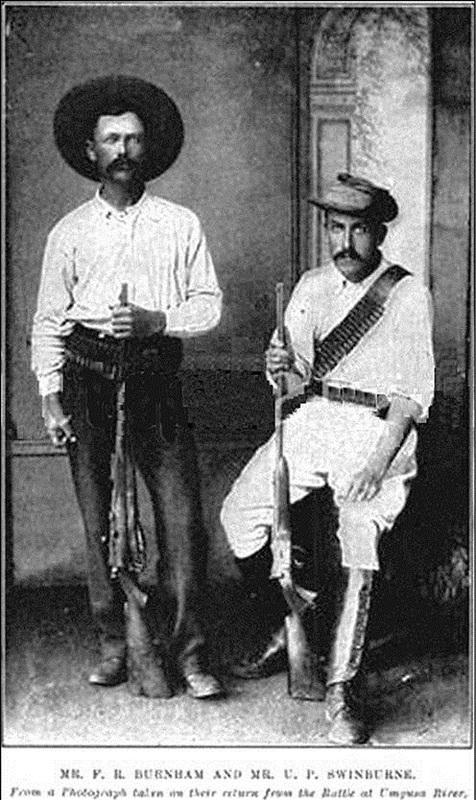 Frederick Burnham, left, during Matabele Wars in Southern Africa, 1896. Burnham’s colorful exploits ranged from fighting for the British in Africa through various conflicts to being celebrated as the “father of scouting” in his home country. Burnham received more awards from Great Britain than any other American during the Second Boer War. The regiment he commanded, the Lovat Scouts, became the first British sniper unit. In his later years he created a program to teach young boys the art of scouting, which eventually became known as the Boy Scouts. The entire saga will soon be made into a movie, “American Hippopotamus”. Edward Norton is signed on as producer. Four hippos did make their way to New Orleans in the 1980s to be purchased by notorious cocaine drug lord Pablo Escobar for his private menagerie on his 7,000 acre estate. After Escobar’s death, the electric fences that kept the hippos at bay ceased to operate. Hippos now roam free in the jungles of Colombia. Besides killing humans every now and then, they do not seem that problematic on the ecosystem. I emailed Jon Mooallem, author of “American Hippopotamus”, because I was curious how hippos could have altered the ecosystem of Louisiana. According to Mooallem, the environmental issues we face today, climate change and rising sea levels, “vastly overshadows any ill (or good) hippos would have done.” He’s not entirely sure how hippos would’ve impacted the ecosystem or native animals. However, “if the hippos have arrived, you might also have huge, industrialized meat production in the region…” with “giant slaughterhouses/cities of meat…” Gigantic hippo slaughterhouses might have accompanied other slaughterhouses of Old Arabi to meet the ravenous demands of New Orleans. Today, water hyacinths still plague much of the Louisiana waters by draining oxygen from the water and prematurely killing fish. The state alone spends millions spraying herbicides to destroy them. I personally remember as a kid many fishing days were ruined because of them. Hippopotamuses are ferocious animals that kill more humans than tigers, lions, and any other animal in Africa. However, I cannot help but believe that some backwoods boys would have easily learned how to track, trap, kill, skin, and make hippo meat just another ingredient in gumbo or hippo bacon an option atop eggs cochon de lait. “American Hippopotamus” by Jon Mooallem. It can be purchased from Amazon Kindle for only $2.99. Mooallem also appeared on This American Life to discuss his research.